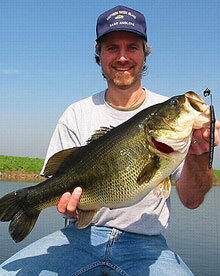 Curt Snow is a RI Bass Fishing Guide with over 30 years of freshwater bass fishing experience. Curt has spent the past 30+ years fishing RI & CT lakes and knows many of the area lakes intimately. If you’re looking for a freshwater RI bass fishing guide or a freshwater bass fishing guide for southeastern CT, Curt is the guide to hire with confidence that he will help you catch fish and make your trip enjoyable, regardless of your level of experience. Care to Try Night Fishing? Maybe you’ve heard about the big bass or the fast action that can be found while fishing at night, but you don’t really know enough about night fishing to try it on your own. Or maybe you’re an experienced nighttime angler but you’re just visiting the RI-CT area and would like to see what Southern New England has to offer. Let freshwater fishing guide, Curt Snow of Night Owl Charters, help you put the pieces of the night fishing puzzle together! Curt has the knowledge needed to night fish successfully on many of the area’s best night lakes, with hundreds of big bass to his credit. The world is a different place at night… especially out on the lake. Everything looks and sounds different. Bull Frogs are croaking, Whippoorwills are calling and BIG BASS are splashing around in the shallows! Night fishing can be the experience of a lifetime, if you’re in the right spots at the right time! Let tournament-winning angler, Curt Snow, use his 20+ years of night fishing expertise to put you on that right spot. If you prefer to fish during daytime hours, Curt also offers daytime freshwater fishing trips on area lakes. Whether you choose to fish during the daylight hours or after dark, rest assured that you will be fishing with someone who knows the lakes well and will do everything necessary to help you catch fish!